Recently a Science Club did a videoconference with a marine biologist in Georgia to learn more about whales. She focused on Gray’s Reef and whales, particularly the right whale that the students hope to see during a trip to Boston. The biologist showed many slides and movies. She explained complex ideas in very simple terms. She used terms such as “momma and baby” that the students could relate to. 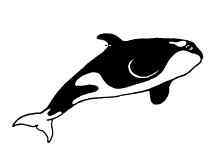 She divided the program into several different segments,each with new and indepth information about whales. She constantly asked factual questions about the information she was giving or asked questions as an introduction to a new segment. Even when a student was wrong, she very politely rephrased the answer so it would be correct. She gave several opportunities for the students to ask any questions they had about whales. She was very aware of the class to whom she was presenting. Her ability to tell stories about the whales made the content very memorable to the students. During the whole videoconference, the longest time in which she did not ask questions was eight minutes during the movie and the slide show. Although the students were interested in the movie and slide slide, their interest was not as high as when she asked them questions or allowed them to ask her questions. The only part that I felt was weak was when she played whale sounds. I wished she had explained the possible purpose of those sounds so that the students did not just think that they were “weird” sounds. The students’ questions to her showed that they had heard and understood what she had explained. Most often the students’ questions requested a more indepth explanation of something that she had said. So what great videoconferences have your had? How could you tell that your students learned as a result of the videoconference? I am helping a teacher do some podcasts so I decided to look at some existing podcasting rubrics. I believe that a rubric should assess student growth on a critical component of an academic standard. I believe that technology is a tool that supports student learning and is not the purpose of student learning. I found that in ALL of these rubrics the value of standards-based learning was considered equal to voice quality, art work, introduction, etc. Student learning of a critical component of a standard counted for 1/6 or less of the rubric grade. Let’s refocus the rubrics so that student learning of an academic standard is weighted the most, like 70%, and all other podcast rubric items support that standard. We can re-work it so that all items focus on the standard such as Does the art work help convey the standard? Does the student voice quality help to emphasize key vocabulary in the standard? If we do not refocus the rubric, then we cannot use it to evaluate student standards-based learning. A non-weighted, non-refocused podcast grade means little, if nothing. Do you use a podcast rubric that focuses on an academic standard? Please share it. Has your district, school, department, or team jointly created the formative assessments that everyone will give on those critical parts of a standard? If you have not done so, use an online blog to discuss ideas before you make the actual decision. Use a computer connected to a Smartboard or LCD so you all see what the changes as you make them. If you all give the same formative assessments, then you can have meaningful discussions about students’ progress and the effectiveness of certain techniques. The teachers can pool their past assessments and the team can modify these assessments to be focused on the critical aspects of the standard. As the teachers talk about changes to the assessments, the changes can be made for everyone to see when an LCD projection is attached to a computer. – be monitored for students’ progress by using a spreadsheet or grading program. 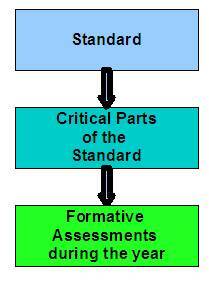 So how often do you use formative assessments for critical parts of a standard? How often do students get feedback on their progress in these critical standards parts? How do you use technology to aid you in this process? Many educational researchers have advocated that USA teachers reduce their curriculum to a smaller amount so that the their students learn it in-depth. Robert Marzano in A Handbook for Classroom Instruction That Works emphasizes that each standard has many levels to it. 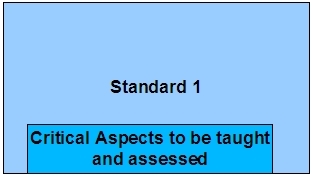 For example, the New York State English Language Arts (ELA) curriculum has only four standards but within each standard there are a plethora of different parts. ELA 1 has about eight major parts which are to be covered in listening, speaking, reading, and writing or 8 x 4 or 32 parts. No one can teach all of ELA 1. The following comments will use ELA as an example; please substitute in your subject area. Has your district, school, department, or team jointly decided which critical parts of ELA Standard 1 your students will learn? What will your students be able to do as a result of learning those critical parts? If each teacher makes her or his own decision, then there is no coherent curriculum. One technology based technique to aid in selecting the critical parts is to project ELA Standard 1 on a Smartboard and have each teacher vote on which parts he or she feels are the most important. You can “x” out those non-critical aspects so that everyone can see what is left. Certainly, no standards should have ten critical parts. Select only a very few that you can actually teach and realistically assess. So how many critical aspects of each standard has your team agreed on? I would suggest having one blog entry per standard. Within that blog entry for the standard, the students has the paraphrase of the standard, the numerous artifacts or evidence and how each shows the standard, and the reflection on growth. 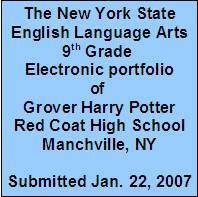 The students enter the blog eportfolio in reverse so the end of the eportfolio goes in first. The title of the eportfolio goes in as the most recent entry. The student has an index on the initial page where each part of the eportfolio is listed. The students will go in their blog, find the URL for the blog of the first standard, copy that URL, highlight the first standard in the listing of the standards on the initial page, and hyperlink it. They will repeat this process for each part of the eportfolio. The students will save their changes. Therefore, this initial index page serves as a quick jumping off point to any part of the eportfolio. If the student has less than ten blog entries which is very probably, then they can simply have the blog list the most recent blogs entries. A reviewer can click from the side listings to navigate through the eportfolio. Another more complex technique is for the students to edit the previous blog entries. They copy the URL of this initial index page, write “index page” at the bottom of each eportfolio part, and link that page to the index. They will re-save each blog entry. Then the reviewer can go from any eportfolio page back to the index page. If you’ve used a blog as an educational eportfolio based on standards, please share your experiences. Robert Marzano in A Handbook for Classroom Instruction That Works had identified that, of all classroom activities, the students benefit most from finding similarities and differences. When the students find similarites and differences, they are using higher level thinking skills. So how can we use this to make students’ learning more powerful? In Social Studies, students can compare two countries in terms of their future potential as a world power in a PowerPoint. The students go beyond just copying facts to looking for the different components of a world power. In English, students can show how the same theme is in two different works of literature through a PowerPoint. They begin to analyze how each theme is presented in the different works and see the variety of ways of expressing this theme. In Science, students can compare the health of two streams through a PowerPoint. The ph of one stream is a static fact but when it is compared to the ph of another stream, students begin to generate many questions. In Math, students can show the similarities and differences between various geometric shapes through PowerPoint. When students put a square next to a rectangle, the differences become apparent. In languages such as Spanish, students can compare the uses of estar and ser through a PowerPoint. By having to contrast these two, they come to see when each should be used. Students can use the many features of PowerPoint such as arrows, text blocks, colored fonts, and shapes to accentuate the similarties and differences between two concepts. As they dramatically illustrate the similarities and differences, they demonstrate their higher level thinking. The students’ PowerPoints are robust learning experiences that maximize their learning since the students compare and contrast. 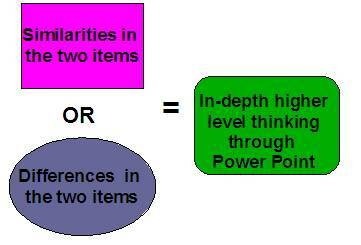 So what similiarities/differences types of PowerPoints have your students done? I talked to someone who is interested in having her students put up their academic eportfolio using a blog. I think blogging is an easy technology that can be private and limited to who views it. Standard overview to see which standard subparts are addressed in the the eportfolio and the student’s self -rating on these standards. An overall statement that shows how the student sees all the standards combined to produce a good English (Math, Social Studies, Math, etc) student. Are their other parts of an eportfolio that you feel should be included?